We needed a gift for my stepdad's birthday. 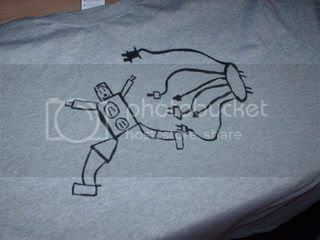 I thought, "Hey, homemade gifts are good ... t-shirts are good ... t-shirts made with a drawing from a 7-year-old? VERY good." And man, did Benson come up with a great drawing! I thought a robot would make a great design (robots are always good) and told Benson that grandpa is an electrician. Benson wanted to know what an electrician did. I said they worked with electricity (genius answer!) and did things like put in outlets and run wires in people's houses. So this is what he came up with. I love the robots face and am having a hard time looking at outlets now without thinking that they're screaming. And I don't quite understand the plug, um, jellyfish? But it works. And Benson informed me there might be more drawings, "like when the robot gets all plugged up!" I just realized my comment says "I" will be very much loved. I meant the shirt will be very much loved. I'm really not that full of myself.